(21412.M48.2, Z. P. Meyers/Barney Hillerman Photographic Collection, OHS). (21412.M48.42, Z. P. Meyers/Barney Hillerman Photographic Collection, OHS). (21412.M48.1, Z. P. Meyers/Barney Hillerman Photographic Collection, OHS). 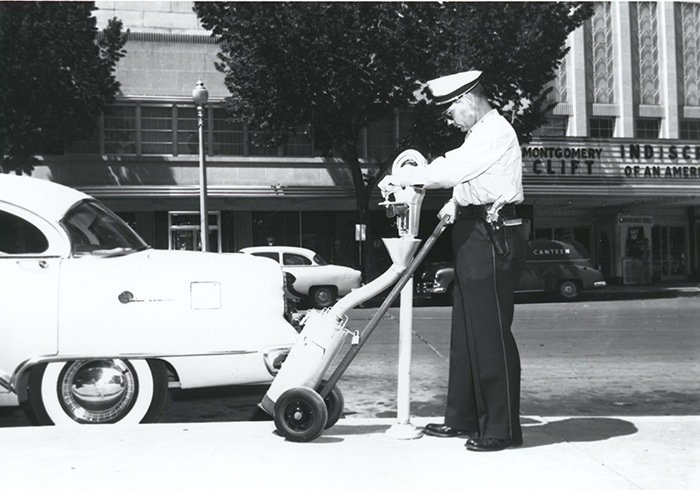 Conceptualized in 1932 by Oklahoma Cityan, Carl C. Magee, the parking meter was a modern solution to a modern vexation, parking congestion. Magee arrived in Oklahoma City from New Mexico in 1927. In his former life he had worked as a reporter for an Albuquerque newspaper, had exposed the Teapot Dome scandal, and had testified against Secretary of the Interior Albert B. Fall. Magee was later arrested for manslaughter in an altercation with a New Mexico judge but was acquitted. Surviving these episodes, he came to Oklahoma City to start a newspaper, the Oklahoma News. Traffic congestion problems in 1920s and 1930s Oklahoma City typified those of most major American cities of the day. In Oklahoma in 1913 there had been an estimated three thousand cars; by 1930 there were five hundred thousand, most of which were registered in Oklahoma County and the capital city. The problem was that people who worked downtown occupied all of the parking spots every day, forcing retail customers to park far away from stores. The city had placed time limits on parking, with enforcement performed by traffic police who chalked tires, marked time, and gave tickets on hourly rounds. The parking situation came under scrutiny by the Oklahoma City Chamber of Commerce in 1932. Appointed chair of the Traffic Committee, Magee assumed the task of solving the problem. Magee decided that the situation required the invention of a small, windable, inexpensively made, mechanical device to "time" the use of each parking space. In 1932 he designed and built a crude model and on December 21, 1932, filed for a patent. In order to refine the concept and build a real working prototype, he joined forces with the Oklahoma State University Engineering Department. Together, they sponsored a design competition with prize money of $160 for the winning design and $240 for the submission of a working model. The contest ran from February 17 through May 6, 1933. Several students built models, but unfortunately none of the submissions was acceptable. 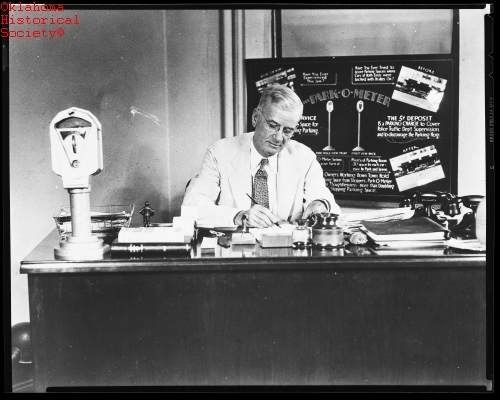 Professor H. G. Thuesen joined the project soon afterward and enlisted the help of Gerald A. Hale, former engineering student and 1927 OSU graduate. For the new model, dubbed the "Black Maria," they created the interior parts; a local plumber made the exterior shell. By late 1933 McGee, Thuesen, and Hale began looking for a manufacturer. The MacNick Company of Tulsa, makers of timing devices used to explode nitroglycerin in oil wells, contracted to manufacture the unit. 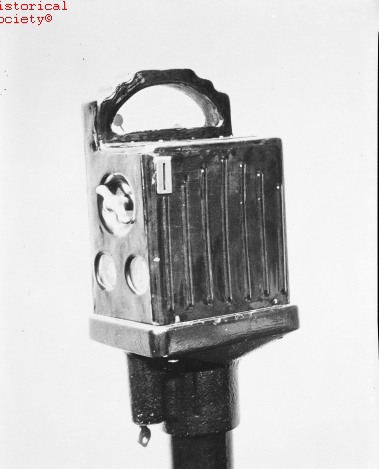 On July 16, 1935, 175 meters were installed and tested on fourteen blocks in Oklahoma City, and when the system proved successful, the city placed meters all over downtown. Magee then raised money from 125 businessmen and incorporated the Dual Parking Meter Company, with offices in the Commerce and Exchange Building, Oklahoma City. The units were first trademarked as the "Dual" and later as the "Park-O-Meter," under patents held by Magee. After World War II a new organization, Magee-Hale Park-O-Meter Company, manufactured the product in Oklahoma City, and Dual was sold to an Ohio company. The impact of the parking meter was threefold. First, it straightened out Oklahoma City's parking problem. Second, it brought revenue into the city coffers through meter money (a nickel an hour) and parking fines (a twenty-dollar fine for each violation). Third, it stimulated a huge growth in the assessed valuation of downtown commercial property. Carl C. Magee had started a trend, and parking meters sprang up in cities across the nation. LeRoy H. Fischer and Robert E. Smith, "Oklahoma and the Parking Meter," The Chronicles of Oklahoma 48 (Autumn 1970). H. G. Thuesen, "Reminiscences of the Development of the Parking Meter," The Chronicles of Oklahoma 45 (Summer 1967). Dianna Everett, "Parking Meter," The Encyclopedia of Oklahoma History and Culture, https://www.okhistory.org/publications/enc/entry.php?entry=PA015.